Brunch is one of our favorite meals! It’s one of the only times you can easily mix savory and sweet, and there are no strict rules about what is an isn’t appropriate for eat. Brunch is also the opportunity to get friends and family around a table to eat and enjoy each other’s company without the pressure of hosting a sit-down dinner. Fruits like apples, pears and cherries can take pride of place at the brunch table or buffet. They are versatile, delicious, and healthy crowd-pleasers. What’s not to love? Here is some inspiration for the next brunch you host for loved ones. Apples are crisp, sweet and one of America’s favorite fruits. Apples for brunch are a fantastic idea as you can bake with them or use them in other unexpected ways. 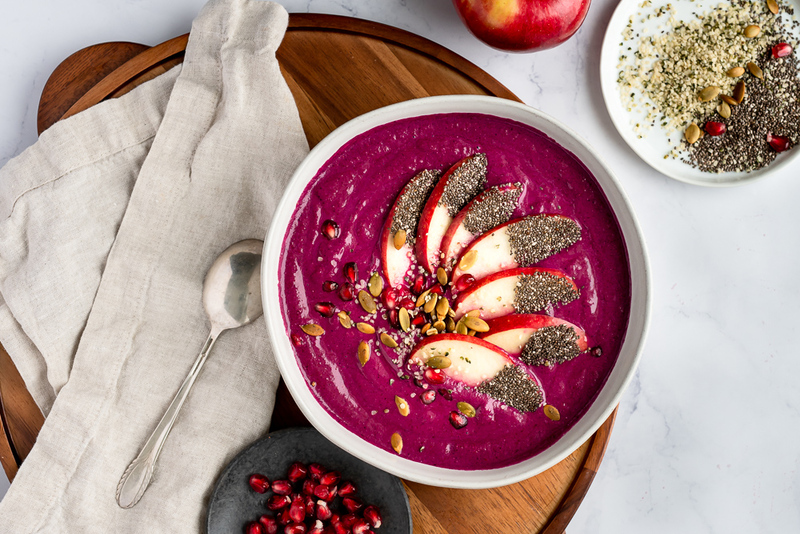 Wow everyone with this ultra-healthy and vibrant apple berry smoothie bowl. Serve in mini-portions if making a brunch buffet. 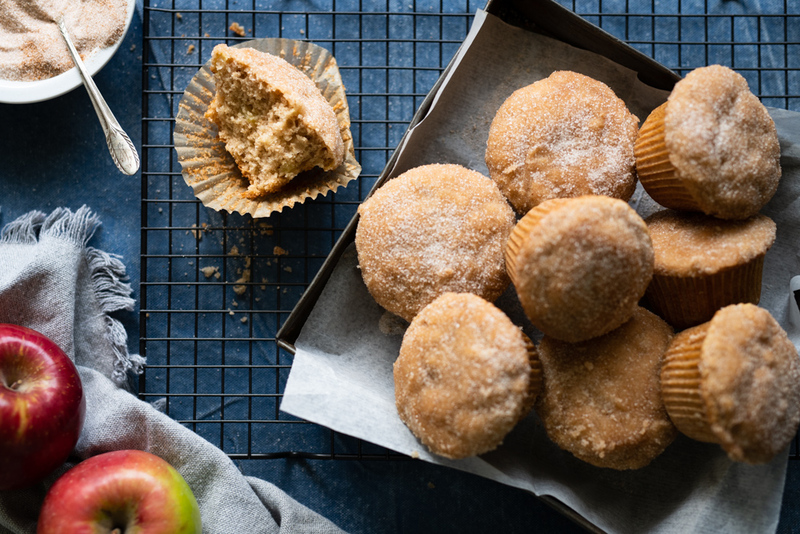 With their crackling sugared tops, these apple donut muffins are sure to be a hit! Using applesauce in the recipe makes them extra moist. 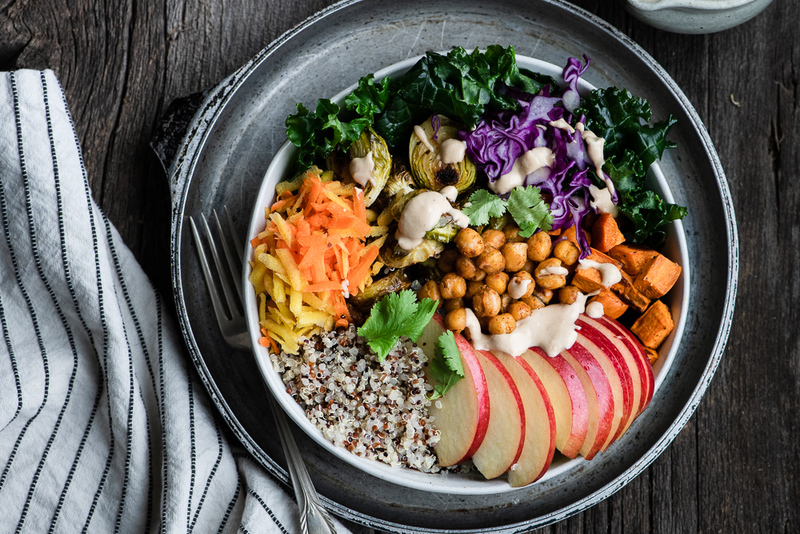 This varied plant-based bowl includes roasted chickpeas, superfood quinoa, crisp apples and a decadent tahini-miso dressing. Juicy pears are a wonderful addition to any brunch menu. Pear brunch recipes can be raw or cooked, playing on the different textures of the fruit. 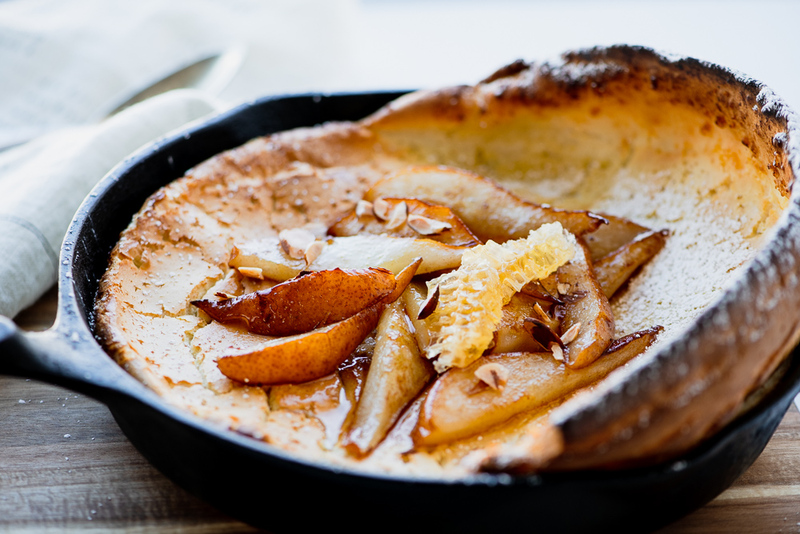 These puffy oven-baked pancakes are scrumptious when paired with caramelized pears and drizzled with honey or maple syrup. 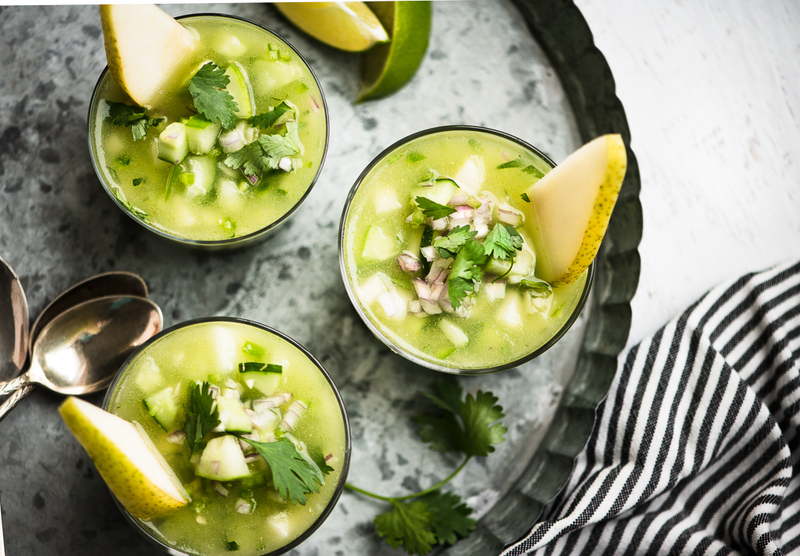 This light gazpacho will add some freshness come brunchtime. An original recipe with some serious wow-factor. 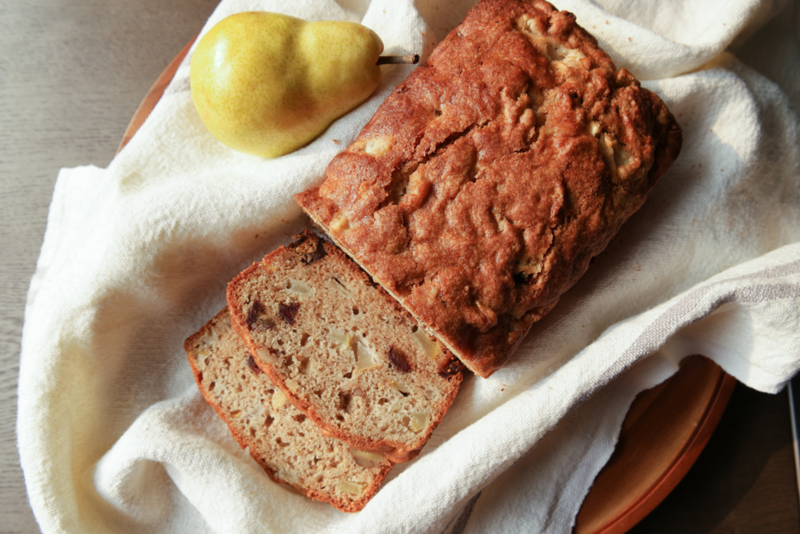 Our comforting pear bread is dotted with chunks of pear, dates, and walnuts. An easy recipe to make ahead and freeze. Cherries for brunch are a no-brainer. These bright little devils will delight kids and adults alike. Use frozen if fresh aren’t in season. 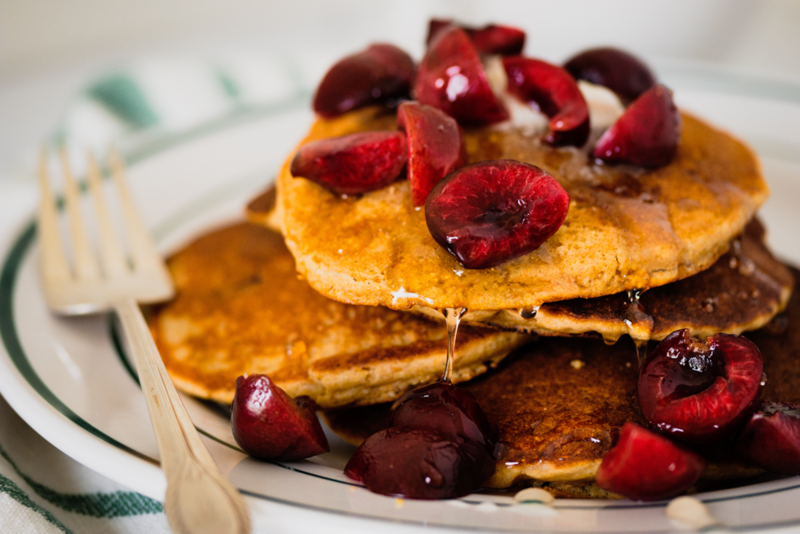 Fire up the griddle and whip up a batch of these amazing cherry cornmeal pancakes! A guaranteed family favorite. Try this original cherry, vanilla and ginger float made with lightly sparkling kombucha. You’ll love this delicious and refreshing treat! 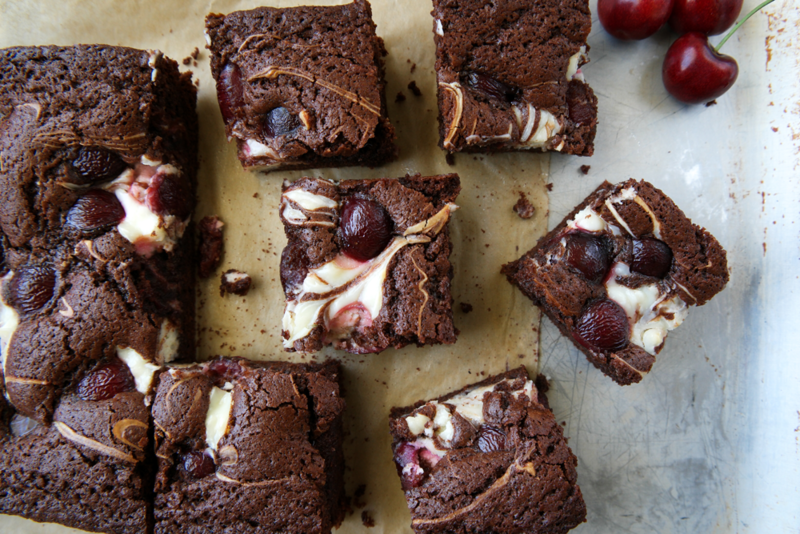 Watch these crave-inducing cherry cheesecake swirl brownies disappear before your very eyes! 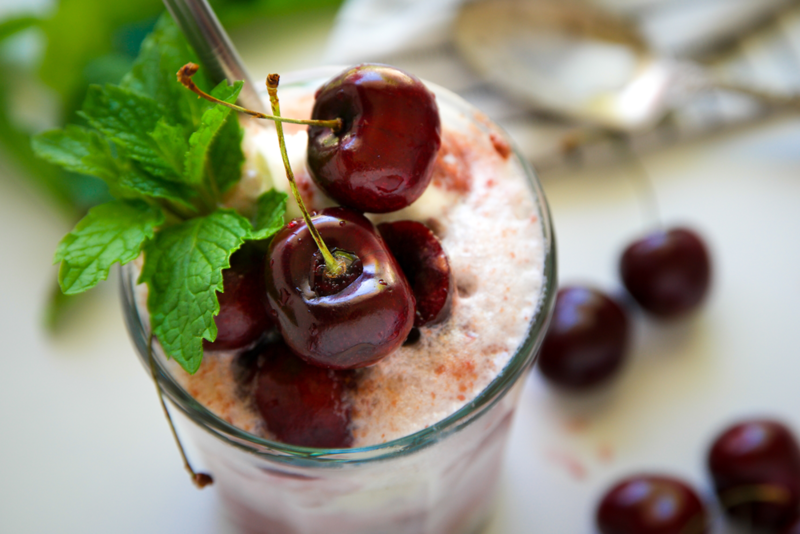 Enjoy the bursts of cherry sweetness in this simple recipe.